If You Want Fresh Fish Chill Out! This Christmas holiday and right on over our Summer Holiday period the following sad story will be repeated ad nausea – and nausea is the right word – all around New Zealand’s coasts. The crew sets out in the morning and over the next four or five hours catches a feed of fish. As they are caught, the fish are chucked into the fish bin where they flap and struggle as they slowly drown in the air. 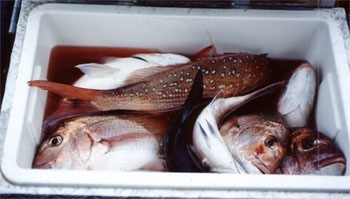 As more fish are caught they are thrown on top of the fish already dead and dying in the bin. By the time this bin of fish, as exemplified in the photo, gets to shore it should not be eaten. The fish have ‘cooked’ in their own blood and slime. What a waste! By the time our intrepid crew get back to the bach, crib, campsite or home, the fish is a smelly, slimy mess. Cleaning and preparing the fish to cook is a long, slow job – the soggy, flabby-fleshed bundles of slime are hard to handle. But eventually fish fillets make their way into the fry pan where foul cooking smells begin to fill every nook and cranny in the immediate vicinity. The whole performance, in a word, disgusting. What a waste. It is a sad fact is that much of the fish served up by amateur fishermen is passed its used-by-date. By the time it reaches the table it is well on the way to being rotten. Many fishermen would be better advised to go fishing on an exclusively catch-and-release basis, and buy some fish to eat on the way home at the fish shop. The fish in the shop would be in better condition – the shop would not be allowed to sell (apart from legal problems) the amateur’s catch because of it’s poor condition. If you want to keep your catch fresh all the way to the table read this..